This month’s Canada 150 post is about Emma Lajeunesse Albani, the first Canadian international superstar. I have to say that I had never heard of Ms. Albani before this, but she came up in a search for notable mid-19th century Canadians so I decided I would do a little research into her life. I have not had much exposure to opera but I find the story of Ms. Albani’s rise to fame to be a fascinating one. …the editor of one of our magazines which was publishing articles describing the dolls of celebrated women wrote to ask me to tell then “about my dolls.” I was obliged to reply that “I never had a doll.” (Forty Years of Song, p. 13). In 1868, Emma went to Paris to study with Gilbert-Louis Duprez (a famous French tenor). Duprez reportedly said, “She has a beautiful voice and ardour. She is of the kind of wood from which fine flutes are made.” Soon, it was suggested that her last name (Lajeunesse) was not suitable for the stage and she adopted the stage name, Albani. She made her debut in Europe in 1869 and was received with great enthusiasm. In 1878, she married Ernest Gye in London, England. 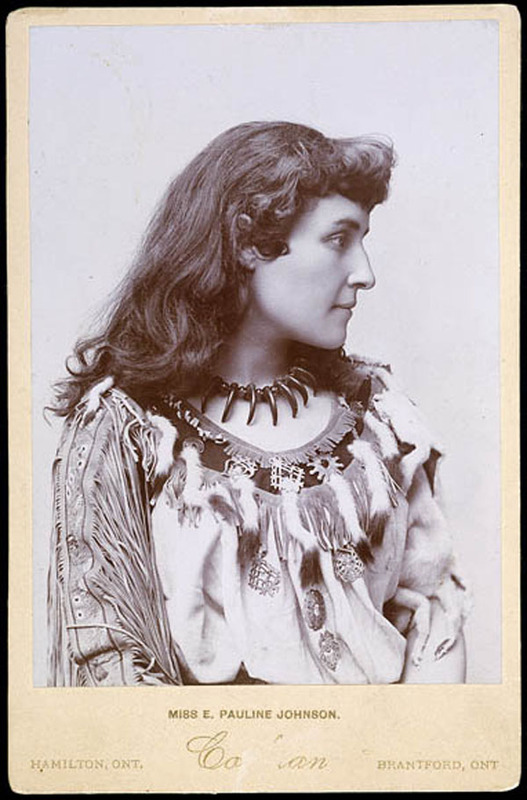 She took a year off from performing in operas the year that her son was born, 1879, but by the spring of the following year was back on the stage. Throughout her forty year career, she had many fans and became a personal friend to Queen Victoria. It was always one of my greatest pleasures to sing for the Queen. She was so appreciative and in the little conversations I had with her ever showed herself so interested, not only in the music, but in many of my private affairs. It was always said of Queen Victoria that she know all about everything and everybody; and, from my experience, I believe she did. (Forty Years of Song, p. 250). When Queen Victoria passed away, Emma sang at her funeral. Unfortunately, when Emma retired from the stage, she and her husband had financial difficulties due to poor investments. She began teaching and wrote her autobiography but by the mid-1920s was in a desperate financial situation. Benefit concerts raised enough money to allow her to live in comfort until her death in 1930. Well, I’m not sure what happened to July but it just flew by! So here it is, a few days late, the July post for my year long project looking at some of the interesting historical figures who were around at the time of Confederation in 1867 here in Canada. Atlantic and far Pacific sweeping her, keel to deck. Aloft, her Empire’s pennant; below, her nation’s wealth. Appraised at highest value, cargoes of grain and gold. Pauline was the youngest of four daughters of a Mowhawk hereditary clan chief, George Henry Martin Johnson and Emily Susanna Howells Johnson, an English immigrant. She was born in 1861 at the Six Nations of Grand River, just six years before Confederation. Her Mohawk name was Tekahionwake, which translates to double wampum or double life. She lived a life that was strongly influenced by both her English and her Mowhawk heritage. Pauline began to write poetry in her teens and continued through her life. She wrote to support herself financially and toured Canada and the United States for seventeen years, reciting her poetry. She was reported to be very beautiful and had great stage presence, which made her a popular performer. She was best known later for how she portrayed indigenous culture and I believe she has a unique approach to using the English style of poetry to portray aboriginal beliefs and legends. If Pauline’s writing speaks to you, take a look at her book Flint and Feather, which is available on the Internet Archive. Tomorrow is July 1, 2017 and Canadians officially celebrate the 150th anniversary of Confederation, the beginning of our country as we know it today. 150 years ago, at noon, the Dominion of Canada was proclaimed, including New Brunswick, Nova Scotia and the Province of Canada (now Ontario and Quebec). This is a celebration worth having, I believe, even though our past has not been perfect by any stretch of the imagination. The Canada of today is a great country and we are trying to make amends for the errors of the past. I really do love this country and I am so proud to be Canadian. I love the people, the landscape and our welcoming attitude to other cultures. There are big celebrations planned across the country and I am sure that the celebrations in Ottawa this year will be a sight to see! I will be celebrating as we always do, watching the local parade, listening to music and ending with a BBQ with good friends. It makes me wonder how Canadians celebrated the beginnings of the Dominion of Canada on July 1, 1867? Church towers and bell towers rang out across the new country at midnight. The Queen’s proclamation was published in the news and read out loud in the major cities. Towns across the new dominion celebrated with military displays, brass bands, illuminations and fireworks. Things did not go perfectly though. Apparently, in Ottawa, the military fired a 101 gun salute on Parliament Hill but they forgot to take the ramrods out of their rifles and the rods flew over Sparks Street! That would have been an exciting but dangerous start to our country! Happy Canada Day! Celebrate the past, present and future of our country and the remarkable people who have lived here.